Sometimes when I bake, I'm lazy. Like, I really want to make something, but I also really don't want to go to the store and get what the recipe requires. So I try to work with what I have. This doesn't always work, but last night, it did. It worked in a wonderful glorious way. Hello there, Salted Dark Chocolate Cookies, my take on the popular World Peace Cookie. But be careful, you might eat all of these before you get a chance to share. And while I'm not against that, I just had to warn you so you don't blame me when you are lying on the kitchen floor surrounded by chocolate crumbs with a dazed "What just happened?" look on your face. 1. 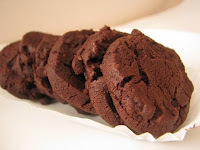 Sift flour, cocoa and baking soda together. 2. Beat butter until creamy, about 1 minute. Add sugars, salt and vanilla and beat an additional two minutes. With mixer speed on low, slowly add in flour mixture. If you add it all at once it will fly up into the air and coat your kitchen in fine powder. So add it slowly, and whatever you do, don't turn the mixer on high. Beat until well incorporated. Add chocolate chips and mix just until incorporated. 3. Place dough onto a non-stick work surface, a smooth countertop or plastic cutting board works well. Working with half the dough at a time, roll into logs that are 1 1/2 inches in diameter. Wrap each log in plastic wrap and refrigerate at least 3 hours before baking. 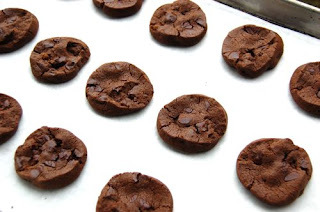 I love that about this recipe, since I was falling asleep in the kitchen at 11pm and would have surely woken up to burnt cookies had I put them in the oven right then and there. I refrigerated overnight and baked in the morning; dough can be refrigerated for 3 days or frozen for 2 months. If you freeze it, just add a minute to the baking time. 1. Preheat oven to 325 Degrees Fahrenheit. Line 2 large cookie sheets with parchment paper. 2. Remove logs from refrigerator or freezer and slice into 1/2-inch thick pieces. If the pieces crumble, just press them back together as necessary. Arrange slices on prepared baking sheet, leaving one inch between each piece. 3. Bake at 325 for 12 minutes (13 minutes if frozen). Promptly remove from oven, even if they don't look done. 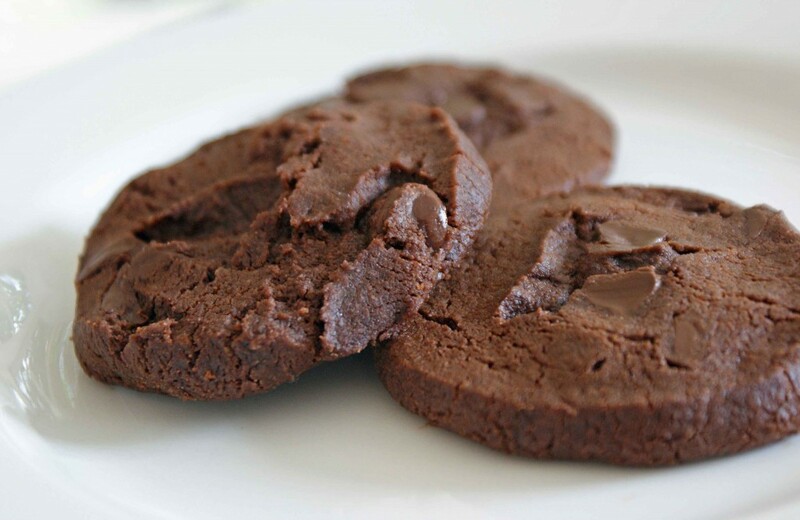 (Just trust me, 12 minutes is all you need for perfectly baked chocolate cookies.) Set cookie sheet on cooling rack and allow cookies to cool on sheet (if you try to lift the off of sheet right away you'll just have a big chocolatey gooey mess). 4. Eat! Warm or room temp, delicious both ways. I also recommend having milk on hand. Totally printing these out to make for Bible study tomorrow. Sidenote: you should add a print feature. Ok, now you can print it...I put in the html code to add the print page icon to all my posts, but it's not coming through, so I just added individually to this one and will go back add to all the others eventually. Let me know if you have a simpler way!